You know that in these times of competitive real estate sales, you must do everything in your power to make your for-sale house stand out among the rest. The first place to start is with the first thing that potential buyers see – the front outside of your house. 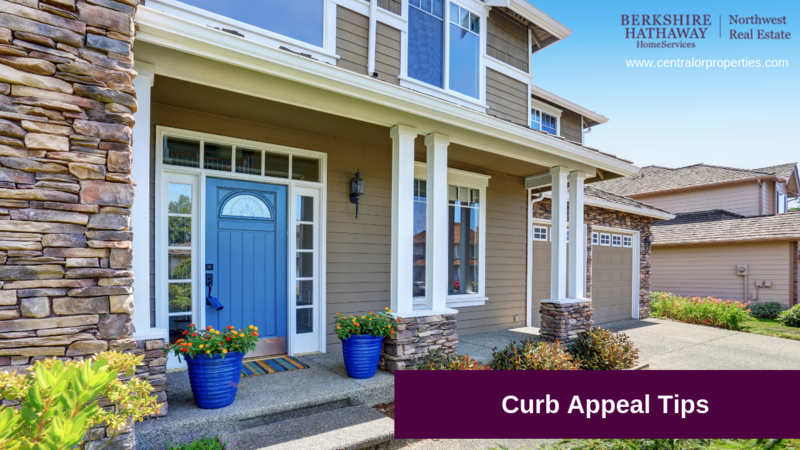 This is called curb appeal, and it can make or break your sale. Below is a checklist of 30 things to do to make the visage of your home the best and most appealing it can be. 1) Power wash the outside of the house. If you have loose, peeling, cracking paint, you’ll need to have the place painted. 2) Power wash the windows outside and clean them on the inside. Be sure to remove debris and cobwebs—these will make windows look dull. If you have a two story home or if you don't want to do this job yourself, it may make sense to hire a professional window cleaner. 3) Clean out gutters and replace if they’re rusty, bent or look old and in disrepair. 4) Rake up leaves and dead vegetation and dispose of it. 5) Keep the lawn mowed throughout the sales process. Make sure sidewalks and walkways are edged neatly. 6) Get rid of weeds, dandelions and grass growing up through the driveway or sidewalks. 7) Trim trees so that no limbs are touching the roof. 8) Affix or replace loose roof shingles. 9) Make sure all yard tools and toys are stowed away. Roll up that hoses neatly. 10) Put bikes, skateboards and scooters in the garage. 11) If you have a basketball hoop, replace the net if it’s torn, dingy or worn. 12) Trim back unruly, unkempt bushes. Remove them altogether if they look scraggly and dry no matter what you do. 13) Install a motion detector light in the front yard so when lookers come by in the evening, they can see the front of the house. 14) Install low-wattage ground lights along the front walkway. 15) Keep the walkway to the house, the driveway and sidewalk in front of the house swept. 16) Plant bright-colored flowers and keep them watered and looking beautiful. Remove wilted dead blooms religiously. 17) Wherever your foundation shows, place a planter with colorful flowers. 18) Give your front door a fresh coat of paint or replace it. 19) Replace the door’s hardware and knob if worn or dingy. 20) Paint or stain your wood fences and repair any broken fencing. 21) Replace the mailbox if it is looking tired, or just give it a coat of paint. 22) Apply large, clearly visible house numbers to the front of your house. 23) Keep garbage barrels in the garage out of sight. 24) Power wash your deck or patio and sand and stain if necessary. 25) Secure any loose railings and boards on your deck. 26) Trim bushes and vegetation around your patio or deck. 27) Set up attractive, comfortable-looking sitting areas in the back yard. You can stage the outside of the house as well as the inside. 28) If you have a dog, be sure to use the pooper scooper on a daily basis. If your dog’s a barker, keep it inside rather than let it stand outside chasing potential buyers away. 29) Remove any wasp nests and ant hills from the premises. 30) Keep all backyard toys and tools put away and the hose rolled up. © 2017 BHH Affiliates, LLC. An independently operated subsidiary of HomeServices of America, Inc., a Berkshire Hathaway affiliate, and a franchisee of BHH Affiliates, LLC. Berkshire Hathaway HomeServices and the Berkshire Hathaway HomeServices symbol are registered service marks of HomeServices of America, Inc.®. Equal Housing Opportunity. Heidi Meier is a licensed Real Estate Broker in the state of Oregon.